With grasslike leaves and late-summer flower spikes, liriopes (Liriope spp.) 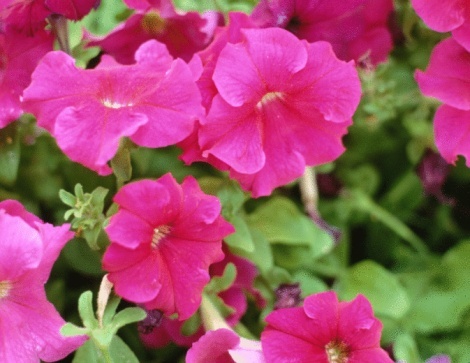 provide lush, low-maintenance ground covers for garden borders and challenging areas. Commonly known as lily turfs, these Asian natives step in from formal edgings to erosion control. Depending on variety, lily turfs grow from U.S. Department of Agriculture plant hardiness zones 4 through 10. Though their growth habits vary, similar growing conditions suit them all. Liriopes offer colorful alternatives to grasses. Lily turfs hold their own where many plants, including turf grasses, struggle for water and nutrients. In full-shade locations heavy with tree roots, lily turfs flourish in spite of their competition. The plants accommodate wide ranges of sunlight, but most prefer dappled to full-shade areas with less than four to six hours of direct sun each day. Sun-filled locations encourage abundant flowering, but they often leave lily turf foliage faded and pale -- especially varieties with variegated or silver-blue leaves. Lily turfs tolerate direct sun well only in the coolest parts of their growing zones. Most common lily turfs belong to two species with different growing patterns and spacing needs. 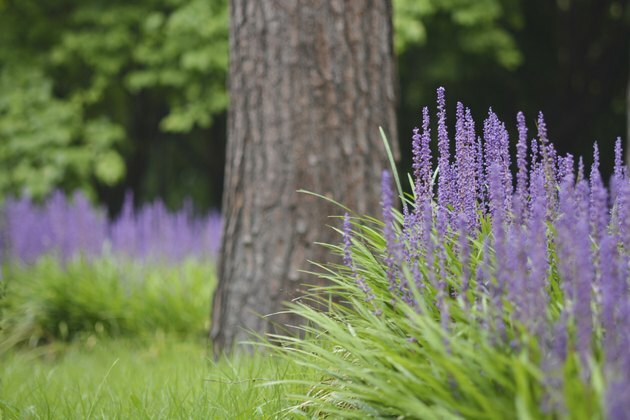 Blue lily turf (Liriope muscari, USDA zones 5 through 10) forms clumps up to 1 1/2 feet tall and 2 feet wide, which expand slowly and non-aggressively via above-ground stolons. Creeping lily turf (Liriope spicata, USDA zones 4 through 10) spreads quickly through invasive, underground stems. Space blue lily turf at 18- to 24-inch intervals that allow for its arching, 2-foot-long, 1-inch-wide leaves. Plant creeping lily turf with its 1/4-inch-wide leaves and fast coverage in mind; space 12 inches apart in staggered rows for a dense, 9-inch-tall ground cover. Lily turfs adapt to all soil types from sand to clay and prefer slightly acidic soil near 6.0 pH. They tolerate poor soil, but gentle nutrition boosts their garden performance. Eliminate weed grasses from soil before planting; weeding lily turf makes wearisome work. Incorporate 2 to 3 inches of organic matter into the soil to a 6-inch depth. Mulch the soil with 2 inches of organic mulch, and then plant through the mulch layer. This keeps lily turfs clean and fresh. Avoid soluble, fast-acting fertilizers; they burn lily turf shoots and roots. Topdress the area annually with a 1/2-inch layer of organic compost for safe, slow-release nutrition. Lily turfs need consistent soil moisture during their first year in the landscape, but excellent drainage is essential. Established lily turfs tolerate heat and drought -- especially creeping lily turf -- but they won't withstand water-logged soil. Overwatering and wet leaves lead to browned leaf tips, crown and root rots, and fungal disease. Water just enough to supplement rainfall and keep soil damp and cool. Never use automatic irrigation on lily turf plantings. Water early in the day so leaves dry before evening and to discourage fungal disease. Lily turfs look their best during the active growing season. Winter months often leave them worse for wear. To restore lily turfs to garden-worthy condition, prune the plants in late winter or early spring before new growth begins. For creeping lily turf, let your lawn mower do the work. Set blades at their highest setting, and take care not to scalp the plants and injure new crown shoots. For blue lily turf, use hedging shears. Sterilize the blades with household disinfectant before and after each plant. Lily turfs have no major pest or disease problems, but bag or compost the cuttings to reduce the chance of disease.